Los Angeles, it has been said, is a city that’s impossible to define. Its enduring presence in our collective imaginations, the diversity of its residents and neighborhoods, plus its sheer size and sprawl; all add up to a picture of parallel worlds loosely connected to one another by activist individuals or institutions. Within LA’s underground music scene, Matthewdavid and his label Leaving Records represents one node of inter-scene connectivity, releasing albums by beatmakers from the Stones’ Throw and Brainfeeder camps along with adventurous avant pop, footwork, beat constructions and unclassifiable experimentation from local and international artists. In recent years, Matthewdavid’s and Leaving’s efforts have revolved increasingly around the revitalization of New Age music – a style of long-form, often beatless, synthesizer-heavy music that came about when European electronic ambient of the Brian Eno and Klaus Schulze schools was taken up by musicians whose intent to facilitate relaxation, healing, meditation, astral travel, and other journeys of the mind and spirit through sound. Somewhat surprisingly, New Age even had something of a commercial heydey in the mid-1980s, with albums by the likes of Vangelis, Kitaro, Yanni, George Winston, Michael Hedges, and others reaching respectable chart positions before being pushed back to the fringes of popular music. And although the trace left by New Age’s first bloom can still be detected in various quarters of latter day electronic music, Matthewdavid and a number of like-minded producers have been spearheading a renewed, earnest reexamination of the genre’s sound and substance. 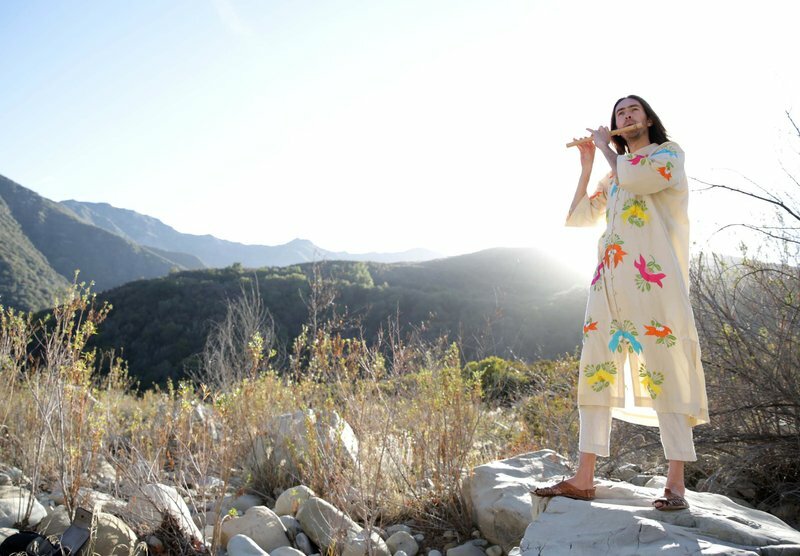 We talked to Matthewdavid about his just released new album “Trust The Guide and Glide” and how the sound of the New New Age relates to Los Angeles and the world beyond. The long-form, meditative, synth-heavy pieces on your new album are pretty far removed from the beats and vocals of your previous releases on Brainfeeder. Is this album a move away from your previous work or is it just a different strain of your musical interests coming into the focus? I’d lean towards the latter, this one is more about connecting with the center, it's the place of origin within my soul from which my creative expression exudes. This material has a lot to do with a time I spent seeking, and finding mediations through sound. Texture and tone to tickle and engage, activating partners of harmonic resonance with drone. I feel this music is more about a devout desire towards the expression of effortlessness. The beats and vocals I feel can be more intellectual, or ego-driven, twisted pop song identities. I’m getting back into the beats again, but from a new perspective. How did your interest in New Age music come about? Was it around when you were growing up and what does it mean to you now? It was around when I was younger, in the late 80s and early 90s my folks had Kitaro tapes, and nature tapes for stress therapy and relaxation. New Age right now represents many things – and dependent on generation, one may have different ideas of what New Age means. My intention for Leaving Records is that it innovates on the New Age – experimenting and expanding upon it for the current times. "Even Low End Theory is super New Age just like Burning Man is New Age"
I owe a lot to Laraaji – we became friends within the past year. I’m now a student of sorts to his philosophies. As for myself, it was not too long ago that I was finally discovering the therapy of sound. That lead to a discovery of self. After these formative first experiences I made a sort of devotion to the inner-teacher. It was during this time I was introduced to “Planetary Unfolding” from Michael Sterns through a deep DJ pal Zach Cowie. The music affixed to my psyche from thereon out, and has been an important and influential album for me. Your label, Leaving Records, has a number of artists in common with Stones Throw. What’s your relationship with them? Is Leaving something like the weird cousin? Leaving is indeed the weird cousin, but we’re close family at this point. Stones Throw was interested in what Leaving was bringing to the LA community and to the music community abroad. Plus, there are hip-hop-leaning releases (and my music) that caught the ears of Stones Throw initially. Leaving is undoubtedly an extension of me, but more importantly I feel it’s a portrayal of the current and future progressive potential of humanity! That’s the whole New Age thing anyhow right? Unity, inter-connectedness / non-dualism, non-prejudice, love. These things lead to finding oneself which in return leads to healing. Your bi-weekly radio show on Dublab radio, Mindflight Meditations, was something like a lab for the kinds of long form pieces that make up the new album. What is your set-up like for those shows and how is it different from your regular studio set-up? Are there any particular challenges / issues for these long-form improvised sessions? The Dublab radio show that I’ve been blessed with became a platform for experimentation with the long-form improvisations during the time I was heavily practicing at home, in seclusion, for therapy. I’ve always felt a liberating tone and quality to Dublab’s programming, plus I’ve always felt welcome and free to experiment on-air. Both processes at home and in-studio are ultra dynamic dependent on my mood and vibration on any given day. To be a bit more explicit, the improvisational processes are centered around the Looper and a variety of ever-changing software and hardware instrumentation. For example: the Critter & Guitari Pocket Piano I use is a simple hardware synth, yet given two uninterrupted hours with this instrument and a comfortable familiarity and knowledge of Live, I feel I’m able to achieve unique results in long-form harmonic texture environments. How do you use Push in your set up? Does it vary depending on what you’re working on / towards? Are you planning on presenting the material from the new album live? If so, what will that look and sound like?